The screenshot above is hosted and provided by vladonai.com. Please contact them directly for any copyright infringement as we are not responsible for that content. Limitations: 30 Trial / After expiration advanced features are inaccessible. 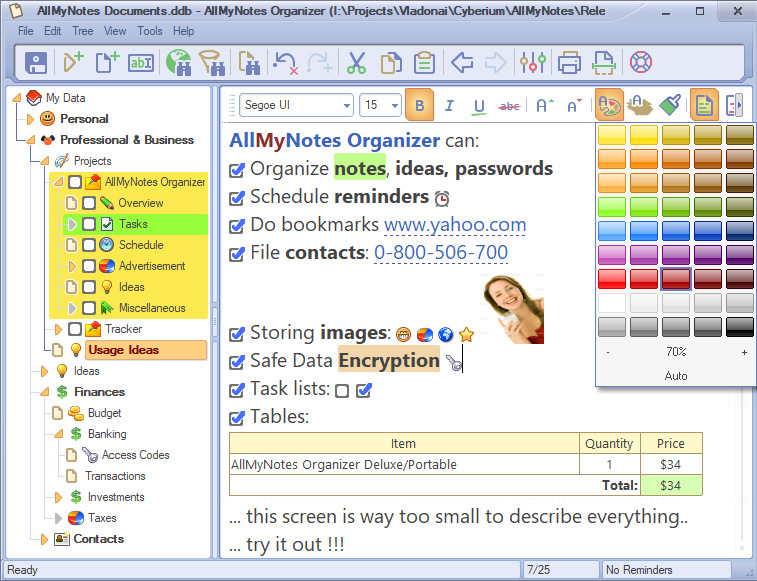 Using All-My-Notes Organizer all your important information is saved secure , locked by password, in one, encoded local file, and notes can be saved into a customizable outline hierarchy of folders. Where do you usually keep all your valuable private info, like, access codes, passwords, various thoughts, secreat docs, alarms, phone numbers and hyperlinks. Feel helpless in tons of papers and tiny doc files? Behold, there is a great answer! A great outliner for organizing data! This is a perfect mixture of instruments for keeping diaries, documents, memories, journal, hyperlinks, addresses, ideas, cites, passwords, projects, access keys, and unlimited any other tasks. Main main functionality inculdes: Quick Find, an Enhanced Editor, password-protected data keeping, Access Protection with Password, Password Generator, Icons, Alarms, Spreadsheets, To-Do Lists, Scanner support, Free-form tree organization, Auto-Backups, Skins, Multi-lingual, Import + Export.